Innovation Have We Reached Peak Graphene? Have We Reached Peak Graphene? 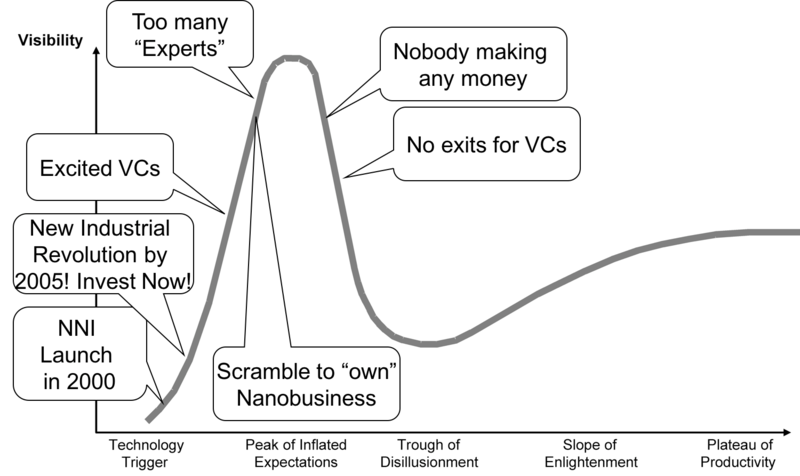 I often used Gartner’s hype cycle during nanotechnology talks to illustrate the danger of believing everything you read, and around 2006-7 we probably hit peak nanotechnology hype. The evidence for this was the growing realisation among nanotech companies, market research publishers, brokers, advisors, consultants and conference organisers that no one was making any money. One by one we saw people drift off into other areas, Cleantech was hot as was the equally vague Emerging Technologies. It could be argued that once an –ology becomes sufficiently well defined it loses interest for anyone more concerned with trillion dollar markets and terraforming the planets of Tau Ceti. The news this week that Alabama Graphite Corporation has given up on graphene made me wonder whether we are approaching a similar point with graphene. The company’s announcement below may reflect the lack of interest in the company’s “naturally occurring graphene” – otherwise known as graphite – and seems to fundamentally misread the market data. It is generally agreed that the largest market will be for exfoliated graphite based graphene rather than the single layer material that the Graphenea numbers refer to. Why AGC Is Not in the Graphene Business. Graphite and graphene are both allotropes of carbon. However, that is where the similarities between the two materials begin and end. One is a historically utilized industrial mineral (graphite) and the other is a recently discovered, cutting-edge advanced nanomaterial (graphene) that the world’s top materials scientists are still researching in order to better understand. Although there are significant monies being invested in graphene research and development around the world, those leading graphene’s commercialization are household names, such as Intel, IBM, Xerox, BASF, 3M, Philips, Dow Chemical, DuPont, Samsung, and Nokia, in addition to the University of Manchester’s National Graphene Institute (the world’s leading graphene research institute) (source: U.S. Department of Energy’s Oak Ridge National Laboratory, 2015). AGC management believes that until there is a major graphene-based commercial application which calls for significant amounts of graphene supply, graphene will generally remain at the gram level in R&D laboratories and universities. Additionally, the global market for graphene sales was estimated to be a mere USD$12 million in 2014 (source: Graphenea, 2015), while the global lithium-ion battery market is conservatively valued in the tens of billions of dollars (source: Taiyou Research, 2014). In determining AGC’s new corporate strategy, it was decided that AGC would not be continuing with further graphene development-related work. AGC wishes to address a tangible, rapidly expanding multi-billion-dollar market with a saleable, in-demand product, as opposed to a nascent, research-based ~ $12 million nanomaterials market, that has yet to develop a significant commercially viable application. It’s the lack of applications which is failing to set the graphene world alight, and I suspect we’ll see an increasing number of graphite miners quietly dropping all mention of graphene. We saw this a decade ago when a number of gold producers saw the huge price differential between gold and gold nanoparticles and imagined a he opportunity, Unfortunately a common characteristic of nanomaterials is that the prices are inversely proportional to the market for the material. In some cased prices will fall and demand will pick up, but that has taken almost 20 years to happen carbon nanotubes, with plenty of casualties along the way, including such heavyweights as Bayer. Early graphene companies are also struggling. Some like Applied Graphene Materials and Haydale have raised more funds, while others have had a hard time on the markets, some have cancelled IPOs and yet more are teetering on the edge of insolvency, and the next year will begin to separate those with a sustainable business model from those whose plan was to make the stuff and hope that customers show up later. With peak graphene already here, I’m off to rebrand myself as a 4th Industrial Revolution expert!